It’s time for a give-away. My three books, part of the Rainbow Publisher’s Five Minute Sunday School series, are hot off the press and I’m so excited about them. They look wonderful and I love this concept. If you or someone you know love teaching children but are short on time and supplies, this series is for you. Maybe you are a harried Sunday School teacher who needs a Plan B for those unexpected moments when you have to throw together a lesson. How about a short term mission trip where you might be able to grab a group of kids together and you want to make every moment count? 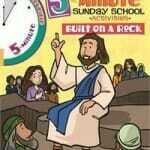 Even if you are a parent or grandparent and you want to give your kids a Bible based activity, this book is for you. All you need is the book and a copy machine or the copy feature on your computer printer. A pair of scissors, pencils and crayons and you are ready to go! 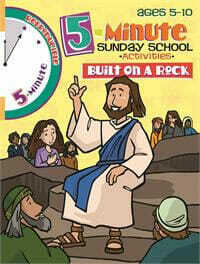 My giveaway this week is the book, “Built on a Rock,” forty-two lesson on the establishment of the church. In my over 30 years of teaching children, I’ve been surprised to find very few lessons about the church in the curriculum I’ve used. Plenty of lessons on Noah, Joseph and baby Jesus, but when was the last time you taught a lesson about the Ephesian Christians getting rid of bad books or or Paul and the poisonous snake? Acts is filled with amazing stories that children can relate to. When so many church institutions have strayed from God’s original plan for the church, we need to show our kids what the church stood for in the beginning. We need to introduce them to these great men and women of faith who were passionate about evangelism, strong enough in their faith to stand up to resistance, and loving and joy-filled enough to reach out with generosity and compassion to hurting, lost and confused people. The church really is an exciting, vibrant group of people that God uses to spread the news of His plan of salvation throughout the world. Invite the children in your life to be part of that exciting group. Most of all, we need to show our kids that the church is build in the solid rock foundation of Jesus Christ, that His leadership and His authorship of this institution called the Church is totally trustworthy. In the meantime, this day, remember this: Use every available opportunity to proclaim Jesus Christ as Lord – especially to the children in your life.